Freshly design, unconventional arrangement and effective equipment support, these are the features of the two new Student-Centred Learning rooms or shortly known as SCL at Faculty of Education, Universiti Teknologi Malaysia (UTM). The idea of ​​renovating the SCL rooms was the result of a collaborative research between Malaysian Research Universities (MRU) and Australian Innovative Research Universities (AIRU). UTM was represented by former dean of Faculty of Education UTM, Professor Dr. Baharuddin Aris, and Research Manager of Faculty of Education UTM, Dr. Abdul Halim Abdullah. Teaching and learning conducted in the SCL room. Furthermore, the motivation to implement active learning spaces in the faculty is derived from UTM New Academia Learning Innovation (NALI) initiative which emphasises blended learning approach. The design of SCL rooms was based on Pedagogy, Space & Technology (PST) Framework. The SCL rooms allow users to act and behave differently, serving as an effective medium for constructivism integration. Inquiry, scenario-based learning, service learning, problem-based learning and collaborative learning which demand active participation and learning mobility are well suited to be conducted in the rooms. SCL rooms applied Pedagogy, Space & Technology (PST) Framework. 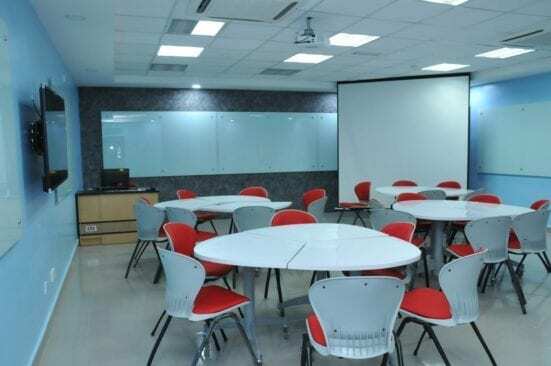 Mobile tables and chairs, multiple whiteboard around the rooms and two projectors at different sides of the SCL rooms allow the student-centred learning approaches to be conducted effectively and successfully. Students and lecturers who had their teaching and learning experiences in the rooms provided positive feedback when asked about the practicality of the rooms in providing the transition from conventional teaching to student-centred approach. In summary, Faculty of Education, UTM realizes the need to upgrade our teaching facilities in the era of education IR 4.0 therefore efforts are being made to transform existing conventional lecture rooms to student-centred rooms.